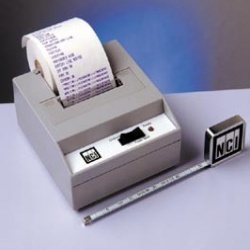 A little printer for BIG jobs, used for data logging diagnostic results in the automotive, alarm, medical, photo copier, and refrigeration industries. 24, 32, & 40 characters per line, 1.5K buffer, double width, double height, reverse print, graphic character sets and 144 dots per line are just some of the capabilities of this printer. Available Baud rates internally configured from 300 - 19.2. All 1200 Series Printers Include: Cool Gray standard tabletop style impact printer; a paper roll 2-1/4 wide and 2-3/4 in diameter; a replaceable black ribbon cartridge; On/Standby indicator LED; USA 120VAC, 60Hz desk mount transformer; operators manual; 1.5K character buffer; Selectable character lines of 24.32, 40 columns; 90-day warranty. The following options are installed at the time of manufacturer only. When ordering 230 or 240 VAC transformers, the standard transformer is replaced. When ordering panel mount kits, please specify paper size required. The following options are shipped with printer at the time of manufacturer or in the field.